Voucher good for Rinnai Tankless Water Heater Ultra Series. Energy Factor of up to .96. Available size: 199,000 BTU. Allows for either Concentric Polypropylene or PVC/CPVC venting, providing the most venting flexibility in a single application of any manufacturer. Easy maintenance is achieved with included isolation valves. Designed for efficiency, saves energy, a smart investment, multiple sizes, replace parts... not systems, maximum output... minimum space, earth-friendly, less waste, high standards with low CO2 emissions. Valid for customers in a 50 mile radius of Sal’s North Royalton location. During normal business hours. 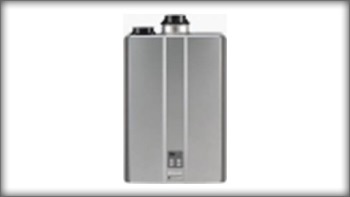 Application must be able to accommodate tankless water heater and within 10 feet of existing water heater replacement. If not, additional charges may apply. 1 year labor warranty and Manufacture part warranty. Sal’s Heating and Cooling will come to determine size of equipment needed. This warranty is transferrable. All permits if needed are additional, no exceptions. Tax not included. Not valid with any other offers. voucher has no cash value. Please note and be advised that due to the requirement of the holding of a State License and code requirements, ANY item purchased MUST be installed by Sal's Heating and Cooling Inc. and are not available for over the counter purchase or receiving. Any voucher purchased will not be available to be used on Sale Items or available in the event that the current Model # advertised is no longer available by Sal's Heating and Cooling Inc. or the manufacturer. We will determine which comparable or closest model to use when installation is scheduled of the item purchased. The voucher must be provided before any services by Sal's Heating & Cooling, Plumbing & Sewer including the estimate, installation or contract is signed or current estimate will be in force and voucher can be redeemed at a different time. Weather permitting, excludes emergency installations. All installations will be done during normal business hours and subject to availability and scheduling. Any code upgrades, city permits, registration fees will be additional and be quoted at the time of the estimate or installation. No exceptions. At Sal’s Heating & Cooling, we offer exceptional customer service. Our goal is to answer each call immediately. Our expert technicians will arrive at your home or business in one of our fully-equipped vans to perform the quality service you need. Valid for customers within a 50-mile radius of Sal's North Royalton location. Application must be able to accommodate tankless water heater. Application must be within 10 feet of existing water heater replacement. If not, additional charges may apply. 1 year labor warranty and Manufacture part warranty. All permits if needed, are additional, no exceptions. Voucher must be provided before any services including estimate, installation or contract is signed. If not provided, current estimate will be in force and voucher can be redeemed at a different time.